Skip & Carol Morris are a dynamic angling pair that will take you on an educational adventure into the delightful world of fly fishing for Bass and Panfish. Skip is a world famous fly tying author whose innovative patterns have made him a favorite among tiers and anglers alike. Carol is an exceptional nature artist and outdoor photographer. All the Flies and Gear you need to get started are shown. Skip explores his favorite patterns for both bass and panfish and he explains how each should be fished. You’ll discover all the gear you need for pursuing both species and learn how to use it. In general the video will provide you the tools you need to enjoying fly fishing these overlooked species. This is a good DVD. It has a lot of information on where to look for fish, even from the bank, and flies to use. I hoped it would have a little more instruction on casting. "This DVD seems to be aimed at trout fly fishermen who are interested in giving largemouth bass and panfish a try. For this reason there really aren't many details on fly tackle other than some general recommendations and a fairly small selection of flies. This was not a problem for me, and I very much enjoyed Skip Morris' non-opinionated and easy-going approach. 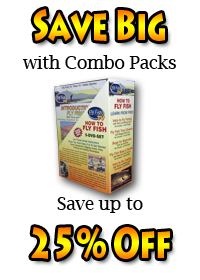 Most of the material is on fly presentations for bass and panfish using a floating line and flies that are floating, diving, and sinking. There are lots of good underwater shots of these basic fly presentations. I found this a good refresher, and it would be very good for a beginner, too. I think it is a good idea not to overload the viewer with too much detail, but instead show the basics that work well. I was very satisfied with this purchase."